For many companies, the beginning of a new year is the time to start thinking about non-financial reporting. 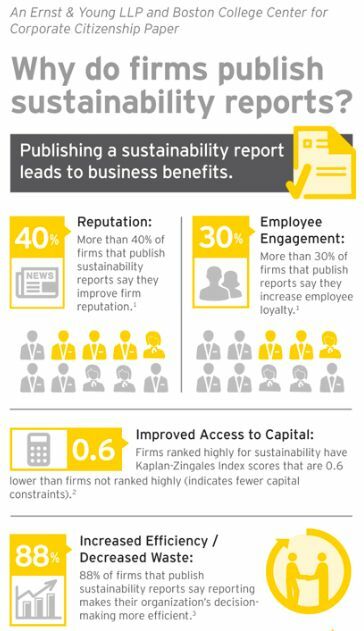 While reports can take different forms, Ernst & Young has identified the transition to the Global Reporting Initiative’s G4 reporting as one of 2014’s top sustainability trends for businesses. Over the years we have seen many companies grapple with what and how to report. While the GRI is a good framework, it is important to remember that every company’s reporting needs are different. So if the GRI G4 does not work for you, consider adapting it to fit your company’s needs, using some elements and leaving others aside. Although a report produced this way will not be GRI certified, you will still secure the benefits of this excellent framework. If you are not ready to do a GRI report, consider producing a carbon footprint report. We recommend clients expand their current reporting with the GRI, even if they do not adopt it fully. Think about what is most important to your company, find a way to balance positive and negative information to come up with a solid accounting of your efforts that go as deep as you want it to go. Why? Because the value of sustainability reporting is well documented. According to a recent Ocean Tomo study, physical and financial assets make up only 20% of a company’s value today. Carbon Disclosure Project found that Global 500 companies that disclose non-financial information publicly outperformed their peers that did not. Identifying and reporting on the most material non-financial information can provide a company and its stakeholders with valuable intelligence to better measure, manage, and assess the business short and long-term. It can also enhance brand reputation, identify potential cost-savings within the company and can even improve access to capital. If you have not yet produced a report, here are seven questions to ponder. Whatever type of report you decide to produce, you will need to have a system in place to gather, process and analyze your environmental data. That will be key. You will need access to detailed metrics, and you may also need to conduct interviews and surveys with stakeholders such as employees, clients, partners, suppliers, and distributors.